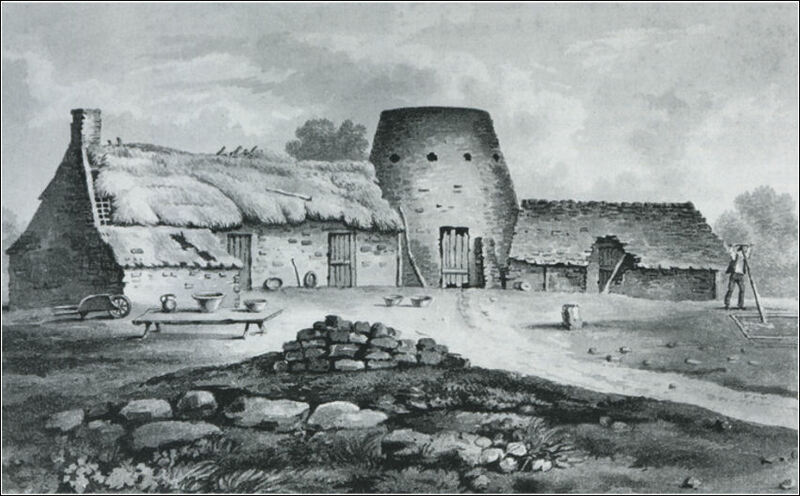 early ware was fired in simple kilns only a few feet in height as this illustration shows. to remove the course grit and make the clay more workable. Robert Plot (13 December 1640 – April 30, 1696) was an English naturalist, first Professor of Chemistry at the University of Oxford, and the first keeper of the Ashmolean Museum. Born in Borden, Kent, he was educated and subsequently taught at Magdalen Hall, Oxford before moving to University College in 1676. Dr. 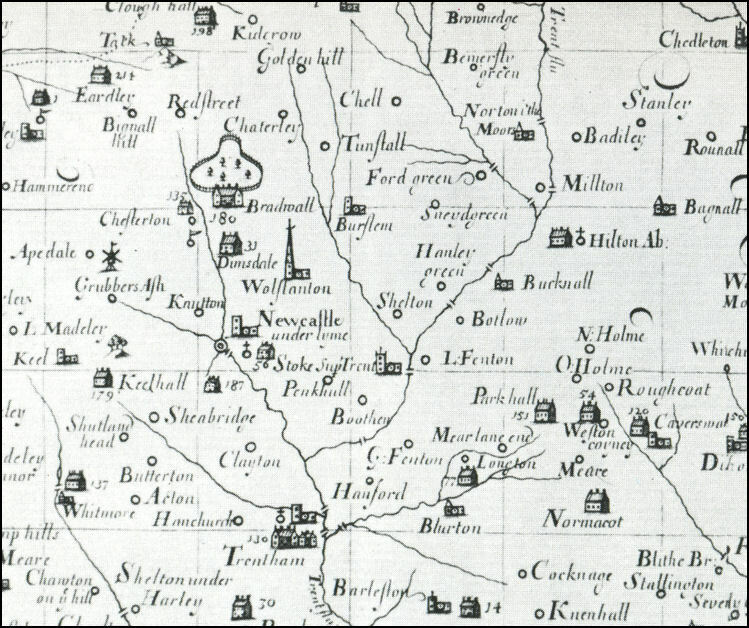 Plot in his natural History of the county (published in 1686) mentions Burslem as being the seat of the greatest Pottery then carried on in the county; but he does not say, whether other neighbouring Potteries then existed, though he speaks of tobacco-pipes being manufactured at Newcastle, and that three sorts of clay were procured from between Shelton and Hanley Green"
’the famous Staffordshire Blue Brick. 'As for tobacco pipe clays they are found all over the county..... And Charles Riggs of Newcastle makes very good pipes of three forts of Clay, a white and a blew, which He has from between Shelton and Hanley green, whereof the blew clay burns the whitest, but not fo full as the White ie it fhrinks more; but the beft fort He has from Grubbers Afh, being whitifh mixt with yellow, it is a fhort britle fort of Clay, but burnes full and white, yet He fometimes mixes it with the blew beforementioned. Bottle clay, of a bright whitifh ftreaked yellow colour. Red blending clay, which is of a dirty red colour. White-clay, so called it feems though of a blewifh colour and ufed for making yellow-colour’d ware, becaufe yellow is the lighteft colour they make any Ware of all of which they call throwing clays, becaufe they are of a clofer texture, & will work on the wheel;"
In Cobridge, between Burslem and Hanley, yellow clay two feet thick lay only seven feet below the surface with six feet of red marl immediately below that. (This in the vertical shaft of a coal mine). Stoneware clays and fireclays were also found within easy reach. The geological strata of North Staffordshire are unusual and, with vertical faulting and extensive outcropping, a very great variety of clays and coals were available on the surface to anyone who dug a little deeper than usual. Red marls were the basic clays used for most early pottery. They were glazed with lead, applied to the dry clay ware as powdered galena (lead sulphide) or ‘Smithum’. Lead provided the gloss, and iron or manganese provided the colour. The ‘pipe-clays’, or white burning clays, were not so abundant and were used more sparingly either to coat the face of an article before decoration - as in slip-trailed ware - or in small amounts as the decoration itself. Later, mugs and jugs had a thin coating of white slip over the dark clay to render them more attractive.